In the case of Belgium, the native money is so unappealing—each denomination features the same profile of King Albert’s fat, bespectacled head (oops, is that treasonable? )—so it’s a joy to see the range of artistic designs on other nations’ coins when I get them in my change. 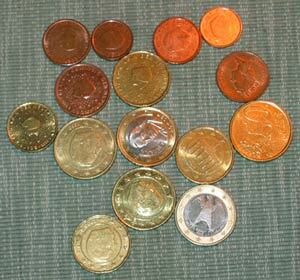 The Euro Coins website is useful for identifying mystery coins that turn up. Conspiracy theorists will no doubt also find something in the fact that British, Danish and Swedish Euro coins have already been designed and minted.